Your skill level -- not what you're selling -- is what makes or breaks you in competitive sales . . . There's a hard fact that we all have to face: Buyers have evolved. They've become shopaholics. They almost never consider a single vendor when making a buying decision. Instead, they call you -- and your competitors -- and choose from multiple options. They know that pitting you against your competition always works to their benefit. In today's sales environment, only the strongest and smartest live to sell another day. Master sales strategist Landy Chase calls these top performers dominant predators -- salespeople who consistently win business, at higher prices, by crushing the competition at every turn. He knows exactly how they do it because he's the one who teaches them how to do it. Now, it's your turn. It's a jungle out there. The goal in today's winner-take-all world of selling is to make every selling opportunity an unfair fight -- in your favor. You have to adapt to your surroundings and take control of your environment. Be assured, your competitors are out there trying to do the same thing. 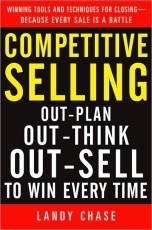 Competitive Selling provides the techniques and skills for seizing the advantage before they even see you coming.